In previous postings I discussed Russian crosses and their inscriptions in considerable detail, so if you were paying attention, today’s image will present no serious problems. It is a relief-carved and painted wooden cross, probably from around the end of the 18th-early 19th century. It should give you a useful review of cross inscriptions. Again, from the previous postings you should be able to recognize that this is a “Priested” Old Believer cross. We can tell that from the presence of “Lord Sabaoth” — God the Father — at the top of the crucifix, and also the presence (though partly hidden by the halo) of the letters ИНЦИ. There are two important elements here: the image of “Gospod’ Savaof” — “Lord Sabaoth,” that is, God the Father, and second the presence of the ИНЦИ abbreviation (though it is partly hidden by the halo of Jesus). These together tell us that this is a “Priested” Old Believer cross — that segment of the Old Belief who kept the notion of the priesthood. You will recall that when Lord Sabaoth is replaced by the “Not Made by Hands” image, and the inscription is also absent on such a cross, it is likely to be a “Priestless” Old Believer cross. Just below them, we see the abbreviated superscription on the cross, the I. N. TS. I inscription that abbreviates Pilate’s text “Jesus of Nazareth, King of the Jews” (Исус Назорянин, Царь Иудейский ). You can easily recognize the large carved abbreviation IC XC abbreviation for “Jesus Christ,” Remember that while the Old Believers use the Ісусъ [Isus] spelling, the Russian State Church uses Іисусъ [Iisus]; “Christ” is Христос — Khristos. With the carved images of spear and sponge on a reed, we see we see by the spear the letter K, abbreviating КОПИЕ — KOPIE, meaning “lance,” “spear.” And by the sponge is the letter T, abbreviating ТРОСТЬ — TROST’, meaning the reed/rod. It is finding little variations on the usual common themes that helps to make the study of icons enjoyable, so it is interesting to see this wooden cross with its rosy pink background and the two very folkish plants sprouting at the sides of the cross. Today we will look at another cross, but not the usual kind. We can tell that right away by the presence of the winged angel on it. But why is the angel there, and who is he? Metal icons often show wear from long use, and the fact that the owners liked to polish them with chalk did not help to preserve surface detail. That is why we often find fine details on metal icons worn smooth. The kind of cross shown here had a string or cord through the upper part. So it is a breast or pectoral cross. The image at the top is the “Not Made by Hands” type, depicting the face of Jesus on the cloth. But again, who is the angel? We have already seen another “Angel of Great Counsel” type in icons of Jesus as the Blagoe Molchanie — the “Blessed Silence.” And this metal cross is another form of Jesus as the “Angel of Great Counsel.” Pectoral crosses of this type are often from the 18th century, though one may find them a little earlier and later as well. A reader in Croatia kindly sent me photos of this cast brass and enamel cross. If you read my previous posting on cross inscriptions ( https://russianicons.wordpress.com/2011/10/27/the-instant-expert-in-russian-crosses), you will find some of that material repeated here. First, this is a “Priestless” (Bezpopovtsy) Old Believer cross of the type called an “altar cross” (напрестольный крест — naprestol’nuiy krest). One can tell it is a “Priestless” cross by looking at the image at the very top. It is the “Not Made by Hands” image of Jesus on the cloth, the so-called “Abgar” image that resulted from the old story that Jesus once pressed a cloth to his face, which became miraculously imprinted on the cloth, and was thus the first Christian icon. If this had been a “Priested” (Popovtsy) Old Believer casting, it would instead have a top image of Lord Sabaoth (God the Father) and the Holy Spirit as a dove; and it would also have the I. N. TS. I inscription that abbreviates Pilate’s text “Jesus of Nazareth, King of the Jews” (Исус Назорянин, Царь Иудейский ). Now let’s look at the middle portion. At the top, we see the IC XC abbreviation for “Jesus Christ,” Remember that while the Old Believers use the , Ісусъ [Isus] spelling, the Russian State Church uses Іисусъ [Iisus]. and “Christ” is Христос — Khristos. It is a common text, found in the Liturgy of John Chrysostom as well as in that of Basil, and repeated in the liturgy of the Third Week in Lent, etc. In the lower portion of the upright beam, we see at left a spear, and at right a sponge on a reed. By the spear is the letter K, abbreviating КОПИЕ — KOPIE, meaning “lance,” “spear.” And by the sponge is the letter T, abbreviating ТРОСТЬ — TROST’, meaning the reed/rod, with the sponge at its top. That leads us to the final two inscriptions. Remember that Church Slavic (like Russian) has no “th” sound, so it is replaced with the “f” sound. Some crosses (like this one) have a little plant at the base, a sprout of new life. (Octoechos: Exapostilarion, Monday Matins — Festal Matins for the Feast of the Exaltation of the Cross. We see the letters K and T for Kopie and Trost‘ (spear and reed/rod). 1. The altar cross (Напрестольный Крест — Naprestol’nuiy Krest): it is placed on the altar beside the Gospel book. These are the large crosses one often sees. 2. The pectoral cross (Нагрудный Крест — Nagrudnuiy Krest, or Наперсный Крест, Napersnuiy Krest). These are the small to medium-sized crosses with a loop or hole at the top, so they may be worn on a cord or chain about the neck. They are worn both by the clergy (priests, monks) and by certain pious people. 4. The body cross (Тельный крест — Telnuiy Krest): These are the usually quite small crosses with a hole or loop at the top, worn around the neck on a cord or chain, and given to each person at baptism. So any Russian Orthodox person wore a body cross. There is a standard iconography in Russian Crucifixion icons, and it is important for the student to understand it, because the Crucifixion is one of the most common types one will encounter. 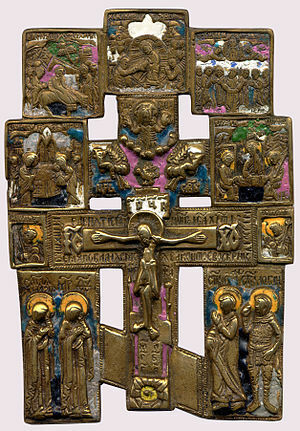 The Crucifixion is often found both in painted icons on wooden panels and in brass castings such as the one depicted here — a “blessing” cross. On both sides of the Holy Spirit, but slightly lower, is an angel. They bear the inscription Angeli Gospodi — Angels of the Lord. Each has his hands covered with a cloth, a practice that shows reverence. Then one often finds the inscription Tsar Slavui — “King of Glory” — referring to Christ. On a sign at the center of the crossbeam just above Christ’s head, we see the superscription borrowed from the biblical account: I N TS I — which abbreviates the Church Slavic words for “Jesus (I) of Nazareth (N), King (TS) of the Jews (I) — Isus Nazoryanin’ Tsar Iudeiskiy. The slanted footbeam itself is notable because of the traditional folk interpretation that it slants up toward Christ’s right hand, indicating the ascent of believers to heaven, and it slants down from his left hand, indicating the descent of non-believers to Hell. Just beyond both sides of the footbeam we usually see towers and other buildings, representing the walled city of Jerusalem. Sometimes, in place of or in addition to these, we see representations of Mary, mother of Jesus at the left, with her standard title MP ΘΥ (Meter Theou — “Mother of God” — a Greek title — and on the right Svyatuiy Apostol Ioann — “The Holy Apostle John.” In painted icons these two are generally shown full-figure, along with other saints such as Longinus (Svyatuiy Login) the Centurion, whose name comes from apocryphal works such as the Gospel of Nicodemus rather than from the Bible. Just under the base of the cross is a little opening in the ground containing a skull and bones (often a skull with two bones that form a sideways X). This skull is identified by the letters G A as Golova Adama — “The skull of Adam.” In icon tradition, Adam — the first-created man — was buried precisely on the site where the Crucifixion later took place. And when Christ was crucified there was an earthquake, and the ground opened just below the cross, revealing Adam’s skull. The very last thing one needs to know about the standard inscriptions is that usually at the bottom of the cross one will also find the letters G G for Gora Golgofui — “The Hill of Golgotha” — identifying the place where Christ was crucified. Рече Господь Аз же терпя, ожидах покаяния вашего и обращения ко мне от зол ваших, зане прежде моего суда страшного многи показах вам пути ко спасению, и образ дах вам собою, милуя вас добре. Вас ради в плоть облекохся, и вас ради труждахся, вас ради алчен бых, желая вашего спасения, вас ради связан от беззаконных, бых, вас ради поруган бых, вас ради заплеван бых, вас ради заланиту ударен бых, вас ради на крест вознесен бых, вас ради гвоздия приях в руку и в ногу мою, вас ради тростию биен бых, вас ради оцта и желчи вкусих, и вас ради копием прободен бых вребра моя, вас ради смерть приях, вас ради во гроб положен бых, вас ради в ад снидох и изведох вы оттуду от тьмы на свет и паки воскресох, показуя вам воскресение от мертвых, и на небеса вознесохся, и вас ради послах Дух Святый в мир на апостолы моя, и послах я проповедати царствие мое, и дах Дух Святый в сердца ваша и поставих вам учители великие, и премудрые книжники, и нарекох вас сынове моя и братию, вы же не тако послушаете Мене, но сотвористе волю диаволю и ангел его, и ныне от идите от Мене, злии делатели неправды, в место, уготованное диаволу и ангелом его, не хощу же вас видети николиже. Such inscriptions added to the believer’s sense that the cross was a powerful “supernatural” talisman that could drive away evil — the same sense that we find in Western horror stories in which the cross wards off vampires. That stands for Nikolai II — Tsar Nicholas II. With that is “Year 1896” (in Cyrillic letter-numbers), and “May, 14[th] day.” That is the date on which Tsar Nicholas II decreed that such a silver pectoral cross was to be given to all priests. 1. The Entry into Jerusalem; 2. The Resurrection of Christ; 3. The Ascension of Christ; 4. The Presentation [of Christ] in the Temple; 5. The Old Testament Trinity. This example also shows, as the figures standing by the cross, not only Mary, Mother of Jesus and the Apostle John, but also Mary Magdalene (Svyataya Maria Magdalini) and the Centurion Longinus. (Svyatuiy Login). Some brass examples add several rods atop the image, with images of seraphim at the upper ends. You will note that this particular example of a brass house cross has colored enamel added to the surface. This was a common practice, and having a bit of enamel fired onto the brass during its making added just a bit to the price, both for the original buyer and often for the purchaser (the collector) of such old items today. Brass crosses and other brass icons were commonly cast in sand molds. Well, now you know far more about crucifixion icons than practically anyone would ever want to know. You are a sudden expert in the matter, knowing what millions do not know. But it probably won’t make you a dime. It is just knowledge for the sake of knowledge, something with which the more curious among us (such as myself, and you, reader, if you have managed to get this far) are afflicted.